When I'm not sewing I enjoy spending my time reading or knitting, but I'm bad about having a balance. I'll be reallyyyyy into reading and knock out a couple of books in a week and neglect knitting to the point that it takes three months to make a pair of socks :/ Right now I'm kind of in the opposite phase (knitting and no reading), so I thought I'd share my current knitting project as well as some of the other things I have made this year. Right now I am working on a sweater, the first one of the year! When I first started knitting I was all about sweaters, but rarely got to wear them. When I make something, whether it be sewing or knitting, I want to make something that will get use and not be chilling in my closet all day, everyday. You have heard me complain about the heat a billion times now (almost as much as I complain about assembling pdf patterns), but when the last time I wore a coat was in December 2013 (I'm not joking) why would I dedicate a significant amount of time and energy to create something only to look at it on a hanger? That said, I'm really really hoping for the cooler weather we are supposedly going to get which is why I am breaking my sweater knitting ban and making the Tin Can Knits Gramps Sweater. I'm using the Cascade yarn in the photo above for the main sweater color and will use a pale pink for the collar and elbow patches. 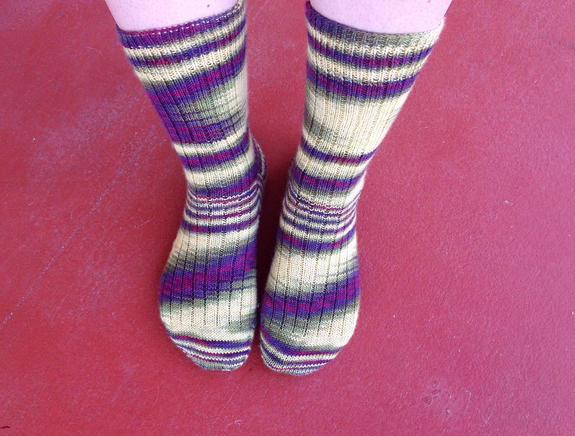 One thing that I have been addicted to making this year are socks. Beanies and scarves don't ever get worn (insert another complaint about the heat), but socks DO get worn on a regular basis and I really really enjoy knitting them. I love that I can throw the yarn and needles in my purse instead of lugging around a project bag of supplies. I love that I can knit two at a time using magic loop and not have to constantly measure the length and hope that they come out with the same amount of rows. Oh, and of course I love shopping for yarn. I'll splurge and spend $20 - $35 on sock yarn because socks only need one skein. Some online shops that I like to lurk and purchase from are Haute Knit Yarn, Republic of Wool, and of course Jimmy Beans Wool. So, let's talk socks. Are there any patterns that I need in my life? 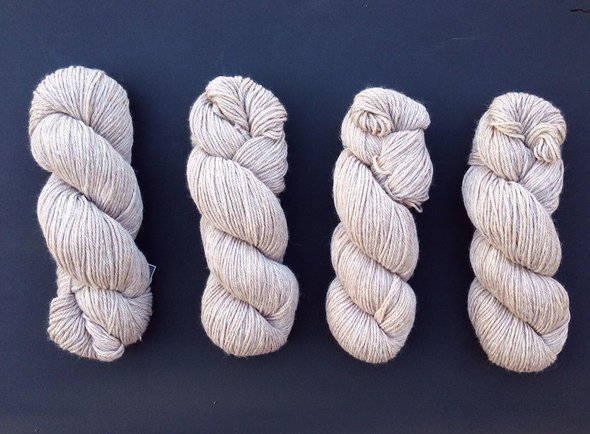 Any yarn places I need to check out? 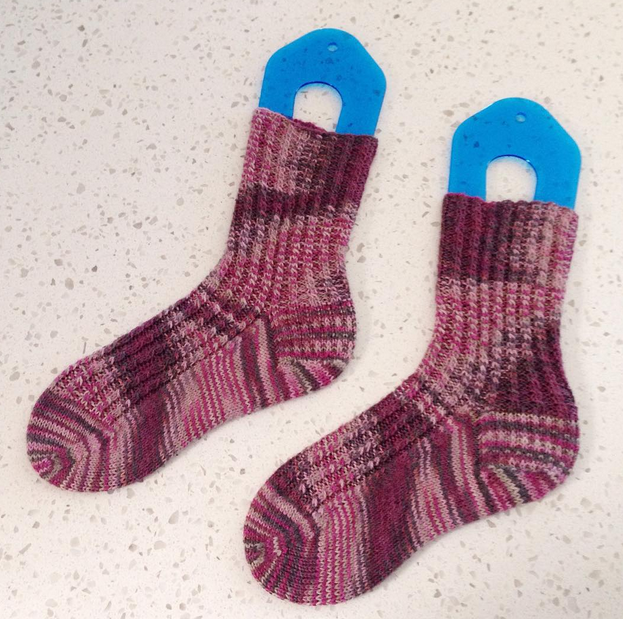 I need to start making socks. I've only ever knit one pair of thigh high lace stockings and I never got past it. 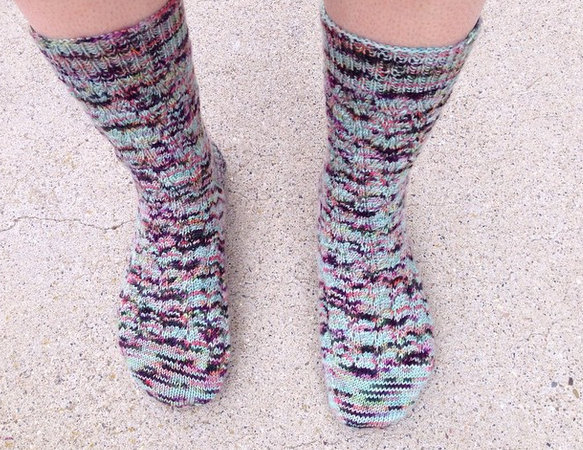 I really want to check out the broken seed stitch socks. They look interesting. I recommend you check out some audiobooks so you can combine two loves. I borrow them for free all the time from the library app, overdrive and it rocks. Right now I think I'm going to go on a hunger games reread spree followed by a Harry Potter holiday audio adventure.